Going into the 2014 mid-summer classic at Minnesota's Target Field, there was little doubt that all eyes would be on New York Yankees shortstop Derek Jeter as he played in his last All-Star Game. Further, there was little uncertainty that Los Angeles Angels outfielder Mike Trout might play a role in the outcome. What was not expected was social media frenzy over comments made by St. Louis Cardinals starting pitcher Adam Wainwright, and how one mistake in a tweet by a reputable news network would illicit viral chatter. Jeter received a fabulous ovation during introductions and FOX did an admirable job in pumping up The Captain’s All-Star farewell (though having Harold Reynolds conducting the interview immediately lessened the quality of the sit-down in my view). Jeter made his presence known in the top of the first inning by making a fantastic diving play on a hard hit grounder off the bat of Pittsburgh Pirates outfielder and reigning National League MVP Andrew McCutchen. Cutch was too quick for Jeter, though the 40-year-old icon showed quick reflexes and a solid throw to first. When Jeter stepped to the plate leading off the bottom of the first, Wainwright showed plenty of class by placing his glove with the ball inside on the mound and stepping back behind it. As Jeter wanted to desperately get into the batter’s box, Wainwright wouldn’t allow it and the second rousing ovation for Jeter lasted just over one minute. Wainwright, who leads the NL with a 1.83 ERA and 12 wins, is considered a fierce competitor. So when he stepped on the rubber and delivered a first-pitch fastball, down and away to Jeter, everyone felt he was zoned in. As a moron in the background near a FOX microphone chanted, “overrated, overrated,” in reference to Jeter, Wainwright’s next pitch, a 91-mph cutter, may have gotten too much of the plate. Jeter displayed his patented inside-out swing, slicing a line drive toward the right field corner. Jeter trotted safely into second base with a double. Up stepped Trout who roped a 3-2 delivery over the head of Los Angeles Dodgers outfielder Yasiel Puig and legged out a triple, scoring Jeter. Wainwright struck out Seattle Mariners second baseman Robinson Cano, but then allowed a home run to Detroit Tigers first baseman Miguel Cabrera. Doesn’t it seem that Trout and Cabrera will be trying to one-up each other for several years? So Wainwright, a debated choice to start the game only because Dodgers hurler Clayton Kershaw has been virtually unhittable in his last several starts, was tagged for three runs before retiring the side. Not a particularly good beginning for his night, and it only got worse. Wainwright, in what will go down as one of the worst PR moments in All-Star Game history, spoke with reporters and let them know he the pitch Jeter hit was a “pipe shot.” He backtracked in the middle of the game during a televised interview in the dugout with Erin Andrews, but the damage was done. 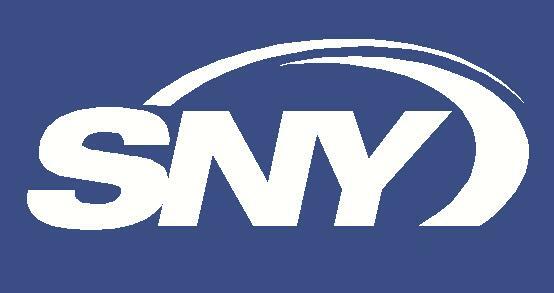 Social media users took to their phones and tablets and lambasted Wainwright for the remarks which certainly detracted from the moment Jeter had. Wainwright claimed that was last thing he wanted to do and should have used different words in describing that he wanted to get a good pitch over the plate to Jeter, something he’d hit to the right side for an out and not make it simple for him to get a hit. That makes more sense with the players hitting directly behind Jeter. There is no value to Wainwright to put a runner on base in a game that carries significance with the winner nailing down home field advantage in the World Series; something the Cardinals would certainly love. I’ll chalk it up to a poor use of words and move on from it. I can’t believe that Wainwright’s comments were meant to disparage Jeter in any way. Jeter blooped a third-inning single over Philadelphia Phillies second baseman Chase Utley in his second at-bat, and was eventually stranded at second base. Jeter got into position in the top of the fourth inning, but American League manager John Farrell sent out Chicago White Sox shortstop Alexei Ramirez to replace Jeter. As the Yankees captain walked off the field the fans showed their appreciation for Jeter one last time as he tipped his cap to the players on the field, in the NL dugout and the crowd. Jeter approached the AL dugout and shook hands and hugged each player and coach going from one end to the other. Once he reached the end of the line the crowd’s cheering intensity had increased again prompting Jeter for a curtain call. He obliged and all I can think of is how difficult it is going to be to watch Jeter do the same in his last at-bat at Yankee Stadium (hopefully in a World Series game; be quiet, I can dream). By now, we had already gotten word of Wainwright’s foot-in-mouth comments. But, not to be outdone, there was one more mistake made that fueled a viral frenzy on Twitter when the CBS News Twitter account published a tweet (see left) out to their millions of followers. 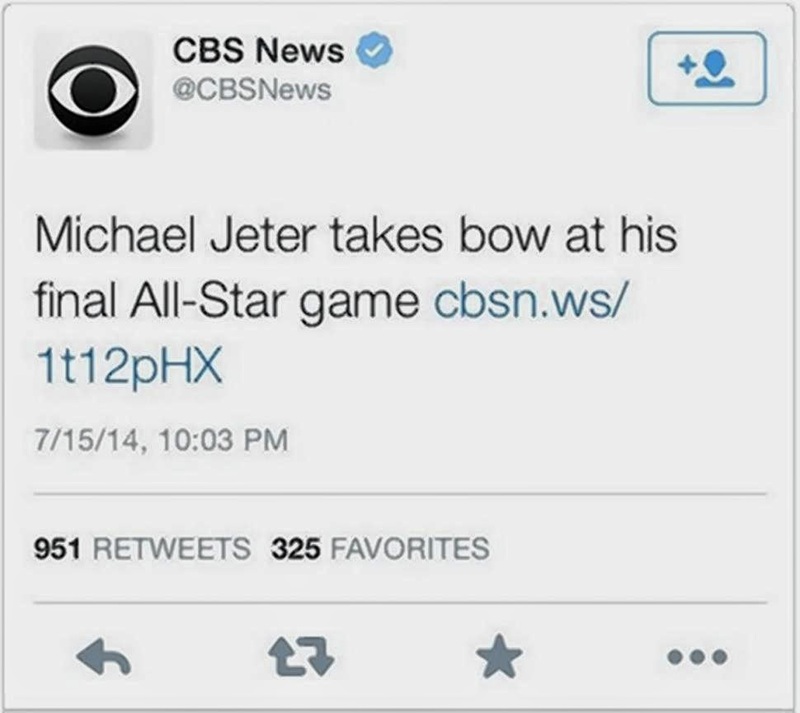 Plenty of jokes and commentary filled the social media site and eventually Michael Jeter was trending. As the game moved along, the National League tied the score at three in the top of the fourth. But in the bottom half of the fifth inning, NL manager Mike Matheny replaced Dodgers’ pitcher Zack Greinke with one of his own relievers, Minnesota native Pat Neshek. Unfortunately, another of Matheny’s choices proved not to work out (he had selected Neshek with Washington Nationals pitcher Stephen Strasburg left off the roster) as Neshek allowed back-to-back one-out singles to Oakland Athletics catcher/DH Derek Norris and Ramirez. Up came Trout and he delivered Norris with a go-ahead double. The AL would tack on another run that inning and that was the end of the scoring. Trout, not Jeter as many Yankees fans hoped, was named the game’s MVP. I’d venture to guess it will be the first of a few in Trout’s career which will be one to watch and who Major League Baseball hopes fills Jeter’s shoes as the face of the game. All in all it was a good game. There was plenty of hype about Jeter throughout the week about whether or not he one should be a starter for the team, and then whether he should have hit leadoff. He came out looking fantastic as always seems to be the case in big games. He finished his All-Star career going 13-for-27. The 13 hits rank fifth on the all-time All-Star Game hit list. Social media took center stage for a time, as there was some rallying behind their man moments as Yankees fans abused Wainwright for “disrespecting” Jeter, while just as many Cardinals fans stuck up for their guy. Then the CBS News tweet lightened the mood again. Finally the play on the field was mostly entertaining. In the end the American League reaps the benefit of two Cardinals pitchers allowing all five earned runs, something naysayers of Wainwright's starting the game and Neshek's participation in the game will likely remind Redbirds fans about for the remainder of the season. The AL will have home-field advantage in the World Series as a result. Could Trout be the benefactor? Will Jeter have one last hurrah? Will Wainwright avenge his performance? We’ll find out in October. For now, I’ll relish in the fact that I saw Jeter in this final All-Star appearance and soak in the next 70-plus games as he winds down his career.